Until now, we have created a Form in Pardot to capture prospects in the database. Over time, based on your marketing efforts, you may have hundreds or thousands of prospects in your Pardot database. Companies send multiple marketing emails to convert prospects into customers. Rather than send same marketing email to all your prospects, you can send relevant content by segmenting your prospects into different email lists. This is especially useful for businesses that have a variety of offerings, and therefore, need to communicate to different prospects. Lists can be used to send list emails or to build Engagement Programs, in Pardot. You can ask your prospects about their interests when they fill a Form; or, based on your prospects’ geography or job title, you can create multiple lists to send relevant information to them. For example, if you are running a small business that offers Salesforce consulting services, as well Salesforce online training, ask your new prospects what kind of information they would be interested in receiving when they either sign up on your website or buy some services from your company. In this article, I will give you an overview of different types of Lists in Pardot. Then, I will show you how to create a Dynamic List and explain why you may want to use a Dynamic List instead of another list, and vice versa. In my next article, I will focus on the features and functionalities of Segmentation List. Dynamic lists offer a flexible way to organize prospects in Pardot and automate your marketing actions. 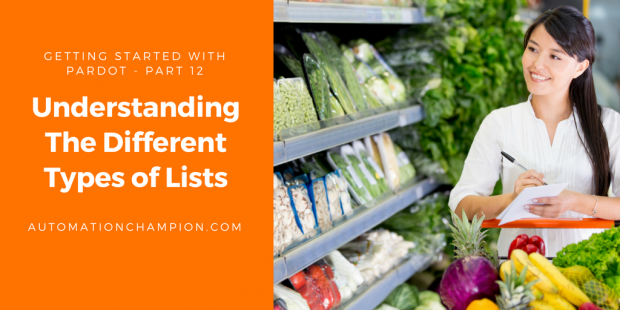 You can build these automatically refreshing lists based on prospects who meet certain criteria. For example, you have created a list called Current Prospect. Currently, Raj Malhotra is part of this list. You are sending marketing contents to members of this list. However, just yesterday, Raj became your customer after purchasing your services. As a result, Raj is no longer a prospect but is now a customer! Since Raj is now a customer, you do not want to send Raj a marketing email that is targeted towards a prospect. To auto remove Raj from Current Prospect list, you have to first define this list as a dynamic list and then set criteria for membership. Email Test List allows you to create a list that will be used for internal testing. Read the rest of this entry!